Lt. Gov. Justin Fairfax, D-Va., has not called for embattled Gov. Ralph Northam to resign. Should Northam step aside, Fairfax would become Virginia's second black governor. Lt. Gov. 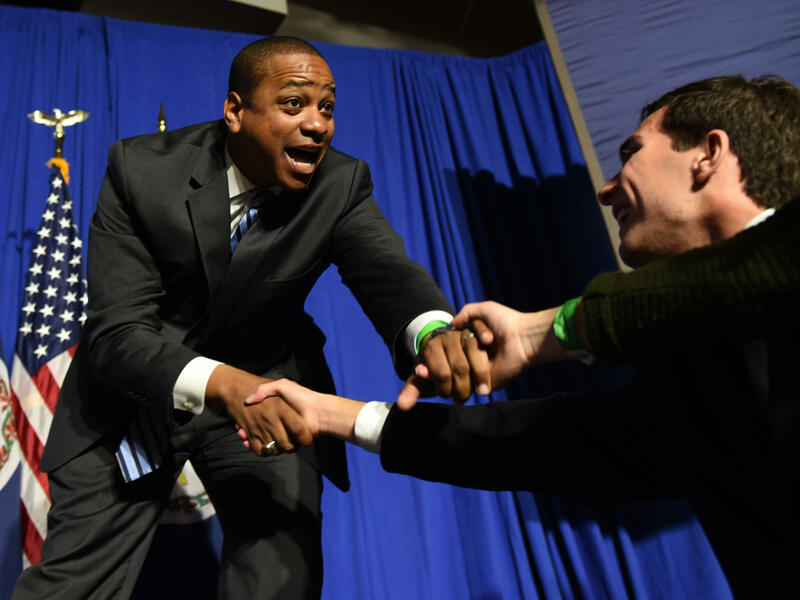 Justin Fairfax is a lot of things Virginia's current governor is not: young, charismatic and part of a multicultural wave sweeping through the commonwealth's Democratic Party. He could soon be called upon to lead the state, should Gov. Ralph Northam, a fellow Democrat, reverse course and adhere to the avalanche of calls — from inside and outside Virginia — for him to resign. If that happens, Fairfax would be only the second African-American governor to serve in the history of Virginia, and one of just a few across the country since Reconstruction. Fairfax, who is 39, was seen as a rising star within the party long before the controversy surrounding Northam's 1984 medical school yearbook page, which includes a picture depicting one man in blackface and one dressed as a Ku Klux Klan member, erupted late last week. Northam has resisted calls to resign. On Monday, Fairfax denied a sexual assault allegation first reported by the online publication Big League Politics. The blog published a screenshot of a chat message from the accuser, describing a sexual assault in 2004. A source close to the accuser confirmed that the screenshot is authentic. The Washington Post has reported that the accuser "described a sexual encounter that began with consensual kissing and ended with a forced act that left her crying and shaking." The Post said it did not publish a story when it learned of the allegation months ago because the publication was not able to corroborate the woman's account. Fairfax, speaking to reporters as he left the state Senate Monday, acknowledged he met the woman in 2004 and said they "ended up going to my hotel room." But, NPR member station WVTF's Mallory Noe-Payne reports, he denied the alleged sexual assault, calling the accusation "completely false," "completely uncorroborated" and "totally fabricated." "Everything was 100 percent consensual," he said. He mentioned his wife and young daughter, saying his family and faith are strong. Fairfax's office also released a statement earlier Monday on Twitter denying the allegation. "Lt. Governor Fairfax has an outstanding and well-earned reputation for treating people with dignity and respect. He has never assaulted anyone — ever — in any way, shape, or form," the statement read, adding that the lieutenant governor "will take appropriate action against those attempting to spread this defamatory and false accusation." Since assuming office a little more than a year ago, Fairfax has drawn praise for standing up against celebrations of Virginia's racist past. As lieutenant governor, one of Fairfax's duties is to preside over the state Senate. Last month, on Robert E. Lee's birthday, while elected officials paid tribute to the Confederate general, Fairfax stepped off the dais and sat in quiet protest. "I want to be clear that my children, my grandchildren will not see me on videotape presiding over a motion honoring people who fought for a set of laws and a society that would have enslaved members of their family," Fairfax told WVTF shortly after the protest. "It was the right thing to do for him and the right thing to do for Virginia," says Jeffrey Bourne, a Democrat in the Virginia House of Delegates. Bourne is a member of the Virginia Legislative Black Caucus, which has called for Northam's resignation. He says Fairfax's protest sent a message that racism and bigotry are things in Virginia's distant past. "It was a great testament and an example of who Justin Fairfax is, and who Justin Fairfax will be in his public service life." Fairfax is descendant of a Virginia slave, named Simon Fairfax, who was emancipated in 1798. The lieutenant governor says that he had a copy of his great-great-great grandfather's manumission documents in his pocket when he was sworn into office in 2018. Fairfax received his undergraduate degree from Duke University and studied law at Columbia, both on scholarship. Before taking office, he served as assistant U.S. attorney for the Eastern District of Virginia. His wife, Dr. Cerina Fairfax, is a dentist who has a family practice in Northern Virginia. They have two young children, Cameron and Carys. For his part, Fairfax has not called on Northam to resign following the revelation that the governor's yearbook page included a racist photo. In a statement Saturday, Fairfax said he was "shocked and saddened" by the images, and he told NBC4 in Washington that he hoped the governor would come to the right decision. "We're at this really important inflection moment in the history of Virginia, and this nation, and we need leaders and leadership that can unite us," Fairfax said. Northam apologized for appearing in the photo late Friday and "for the hurt that decision has caused then and now." On Saturday, he reversed his position, saying he was actually not in the photo. "Fairfax is the leader Virginia needs now"
Virginia Democratic Sens. Tim Kaine and Mark Warner have called on Northam to resign. So have leading presidential hopefuls Sens. Cory Booker of New Jersey and Kamala Harris of California. So did former Vice President Joe Biden, who also tweeted over the weekend that "Justin Fairfax is the leader Virginia needs now." Not to mention President Trump and former presidential candidate Hillary Clinton, who have also called for a resignation. Rachel Bitecofer, a political science professor at Christopher Newport University in Newport News, Va., says Fairfax leading Virginia through this time of healing could be a good thing for the state. "I do think there's a lot of symbolic value from having Justin Fairfax become the state's governor at this critical juncture in American politics, particularly here in Virginia where racial politics have been so much in the limelight." She points to the deadly clashes in Charlottesville, Va., at a Unite the Right rally, and to 2018 GOP Senate nominee Corey Stewart, who ran as a champion of Confederate values. She adds that should Fairfax serve the remainder of Northam's term, he would be eligible to run for a full four-year term in 2021. Under Virginia's Constitution, governors are limited to one elected four-year term. But because Fairfax would assume the role, he could run again. Two political careers are right at the edge of change in Virginia this morning. One is that of Governor Ralph Northam. The Democrat apologized for a racist photo discovered in his medical school yearbook from 1984. But he then said the photo did not show him. And he has been trying to keep his job amid many calls to resign. The other career right on the edge is the man who would take charge if Northam is pushed out. Lieutenant Governor Justin Fairfax is only the second African-American elected statewide in Virginia history. NPR's Brakkton Booker has this profile. BRAKKTON BOOKER, BYLINE: Even before Justin Fairfax won his last election, he was getting a lot of buzz. Here's former President Barack Obama telling a Richmond crowd in 2017 that Justin Fairfax would make Virginia proud. BARACK OBAMA: Justin went to college, went to law school, gave over his life to public service just to make sure that any striving young kid could have the same chances he did. BOOKER: At his victory speech a few weeks later, Justin Fairfax thanked two titans of Virginia politics. The first, Linwood Holton - he's the Republican governor who took office in 1970 and helped put an end to segregation practices in Virginia. The other shout-out was to the only other African-American ever elected statewide. JUSTIN FAIRFAX: And I also stand on the shoulders of a great man, L. Douglas Wilder, who was elected lieutenant governor of Virginia in 1985 and governor 1989. And I thank him for his leadership. BOOKER: Fairfax got his undergrad degree from Duke and studied law at Columbia, both on scholarship. His wife is a dentist, and they have two young kids. At 39 years old, Justin Fairfax is a lot of things Governor Ralph Northam is not - young, charismatic and part of a multicultural wave sweeping through Virginia's Democratic Party. Here's Fairfax speaking on WAMU's "Kojo Nnamdi Show" the day after his 2017 victory. FAIRFAX: Virginia will be the match that sparks the wildfire of progressive change all across this country. And I believe that that's what's going to happen. BOOKER: Since the racist photo of Northam's yearbook page surfaced, demonstrations popped up outside the governor's mansion. UNIDENTIFIED PROTESTERS: (Chanting) Hey, hey, hey, no governor in the KKK. Oh, oh. BOOKER: Virginia Democratic Senators Tim Kaine and Mark Warner have called on Northam to resign. So have presidential hopefuls Senators Cory Booker of New Jersey and Kamala Harris of California. Former Vice President Joe Biden has too, adding on Twitter that, quote, "Justin Fairfax is the leader Virginia needs now." For his part, Fairfax told NBC4 in Washington he hoped the governor would make the right decision. FAIRFAX: We're at this really important inflection moment in the history of Virginia and of this nation. And we need leaders and leadership that can unite us. BOOKER: Fairfax assuming the role of uniter in chief may be just what Virginia needs at this moment. That's according to Rachel Bitecofer. She's a political science professor at Christopher Newport University in Virginia. RACHEL BITECOFER: I do think there is a lot of symbolic value from having Justin Fairfax become the state's governor at this particular juncture in American politics because, particularly here in Virginia, racial politics have just been so much in the limelight. BOOKER: She points to the deadly Unite the Right rally in Charlottesville about a year and a half ago. Then there was this just a few weeks ago on the floor of the Virginia Senate. UNIDENTIFIED REPRESENTATIVE: Mr. President, I rise today to celebrate the 212th birthday of Robert E. Lee. BOOKER: Elected officials paid tribute to Confederate icon General Robert E. Lee. As lieutenant governor, Fairfax normally presides over the chamber. But instead, he sat in quiet protest. Fairfax is a descendant of a slave, Simon Fairfax, who was emancipated in 1798. He explained his boycott to member station WVTF. FAIRFAX: I want to be clear that, you know, my children, my grandchildren, you know, will not see me on videotape presiding over a motion honoring people who fought for a set of laws and a society that would have enslaved, you know, members of their family. JEFFREY BOURNE: It was the right thing to do for him. It was the right thing to do for Virginia. BOOKER: That's Jeffrey Bourne. He's a Democrat in the Virginia House of Delegates and a member of the black legislative caucus. He says with that protest, Fairfax sent a message that racism and bigotry are things in Virginia's distant past. BOURNE: It was a great testament and an example of who Justin Fairfax is and who Justin Fairfax will be in his public service life. BOOKER: He hopes the next call to service for Justin Fairfax will come soon when he's sworn in as the 74th governor of Virginia. Brakkton Booker, NPR News. Transcript provided by NPR, Copyright NPR. Virginia Gov. Ralph Northam faced mounting pressure to step down Sunday after a racist photo published on his 1984 medical school yearbook page sparked controversy on Friday that he has been unable to contain or control. And one of Northam's biggest problems is that the loudest, most strident calls from his resignation are coming mostly from political allies, Democrats from across his state and across the country.